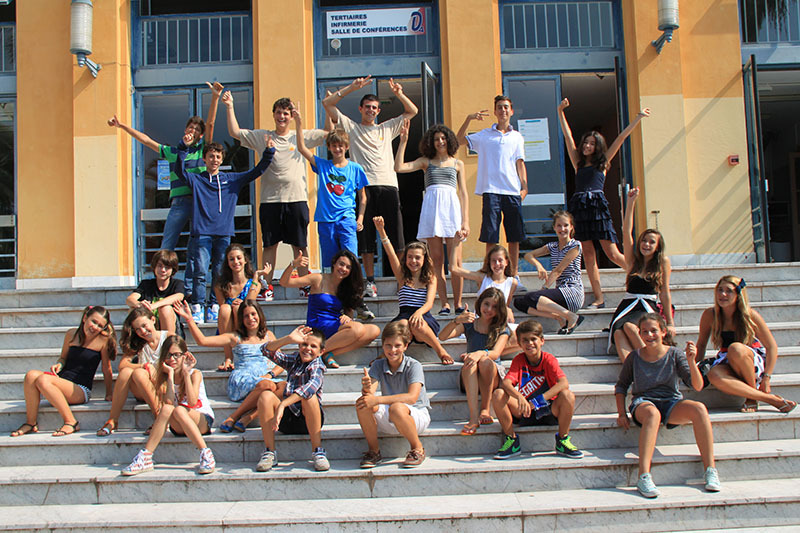 Our partner school in Nice, Azurlingua Juniors, offers a complete summer camp package for students of 8-17 years old. Programmes are available to suit the needs of each individual, as you can choose the intensity of the classes, type of accommodation, and even book extra sport activities such as tennis or diving classes in addition to the standard programme! Apart from French classes and accommodation, all the activities, transfers and meals are included. In other words: the perfect way to spend your summer holiday. Level test on the first day of school: you will be placed in the right class according to your level. Sport activities such as: football, table tennis, handball, basketball, volleyball, beach volley, game of bowls, badminton, dance, relaxation, martial arts. Students can also borrow games at the residence, as long as they sign up for it on a list. Students will always be accompanied during activities/excursions by the programme’s animators. It is also possible to book diving or tennis lessons in addition to the regular activities. Please contact us for more information and prices. Curfew: Students are not allowed to leave the campus without a monitor. Social programme: included. Daily activities and 1 full-day excursion each week. Our partner school Azurlingua offers a language program for children aged 8-12 years in summer. The language program is an all-inclusive, carefree full package with lessons, board and lodging, an activity program and 24/7 supervision. Students receive classes on campus where they also live. If you are traveling to Nice and want to book the language program for your children without accommodation, this is also possible (prices on request). Residence Les Eucalyptus is open from 30/06/2019 - 17/08/2019 (age 8-17). In 2019 the school is closed on: 22/04/2019, 01/05/2019, 08/05/2019, 30/05/2019, 14/07/2019, 15/08/2019. Missed lessons due to bank holidays will not be refunded or rescheduled. In July and August a free activity will be organized in the afternoon. Curfew: Students under 16 are not allowed to go out alone. Students over the age of 16 years can go out alone provided they have parental authorisation signed upon registration. The latest curfew for students with permission to go out is 1.00 am. Social programme: included. 5 cultural or sport activities per week, 1 half- excursion and 1 full-day excursion. You can choose between 20 or 26 lessons per week, each lesson of 45 minutes. During classes students will improve their vocabulary, grammatical knowledge and French communication skills. In the course of 26 lessons, students can also aim to prepare for special exams such as DELF. Students staying in the Residences “Les Eucalyptus” or “Parc Imperial” will have their classes and activities on-site. They will have breakfast, lunch and dinner in the school cafeteria. Students staying at “Les Collinettes” will have all their classes, activities and meals at the campus of “Parc Imperial”. Students staying in a host family will have classes, activities and lunch at the campus of “Parc Imperial”. Breakfast and dinner are served by the host family. Host families are available from 17/03/2019 - 26/10/2019 (age 12-17). Residence Les Collinettes (accommodation in single rooms ensuite) is open from 30/06/2019 - 10/08/2019. Residence Parc Imperial (accommodation in shared rooms, 3-4 persons per room) is open from 23/06/2019 - 17/08/2019. Social programme: included. 1 cultural or sport activities per week, 1 half- excursion and 1 full-day excursion. This course combines the general intensive course of 20 lessons with a scuba diving programme of 5 half-days diving per week. Scuba diving trainings are always supervised by professional instructors and take place at the Poseidon Club, located at the Port of Nice. There is even a possibility to prepare for the international ‘PADI’ exam. Please contact us for more information if you are interested in doing so. Medical authorization is required. Transportation to and from the harbor is included. This course is only available for students aged 12-17 years and takes only place in summer. This course combines the general intensive course of 20 lessons with 5 halfday tennis training sessions per week. The course is supervised by instructors who are fully accredited by the French Tennis Federation (FFT). A medical certificate is required. This course combines the general intensive course of 20 lessons with a sailing programme of 5 half-days sailing per week (from Monday to Friday). These sailing lessons are supervised by professional instructors and take place at the Port of Nice. Medical authorization is required. There is a free shuttle bus from the summer camp to the sailing club and back. Residence "Les Eucalyptus" is located in a very quiet district, within 13 minutes walking distance from the beach and with free shuttles to reach the city center. The Eucalyptus residence has a capacity of 150 students at a time. You'll stay in quad rooms (for 3 or 4 students sharing a bedroom), all bright and spacious. Each student gets its own single bed, desk and wardrobe. All the bedrooms have 1 shower, 1 toilet and 2 washing bassins.Clean sheets are provided weekly. All meals take place in the school cafeteria. Attractive menus are available in this campus every day. Special diets are also possible on request (vegetarian, gluten free. )Monitors will also stay in the residence, meaning there is a 24/7 supervision. This residence is located in walking distance from the city center and the beach. There are 250 rooms, a lounge area, computers, a TV room and public telephones. You will stay in a single room, with your own sink, shower, closet and a study desk. Bed linen and towels are included. The residence has Wi-Fi. You will have all meals, classes and activities on the campus of “Parc Imperial”, which is only 5 minutes walking distance away. The first day the monitors will show you how to walk to the school. Students younger than 16 will always be accompanied back to the residence after afternoon or evening activities. Monitors will also stay in the residence, meaning there is a 24/7 supervision. Curfew: Students under 16 are not allowed to go out alone. Students over the age of 16 years can go out alone provided they have parental authorization signed upon registration. The latest curfew for students with permission to go out is 1.00 am. This campus, which once was the property of a Russian Tsar, is located in a quiet neighborhood and can accommodate up to 130 students. The city centre and the beach are at only 20 minutes walking distance away. You will stay in multi-rooms, shared with 3 or 4 students. There is 1 bathroom per dormitory. The residence has its own classrooms, cafeteria where all meals take place, and sport playgrounds. There is even a swimming pool just a short walk from the residence. If you choose to stay with a host family during your summer course in Nice you will practice your French even more! All host families are chosen with great care and you will find yourself in a friendly and family-like environment during your stay in Nice. You will share a room with another student, although it’s also possible to request a single room with a supplement. You will have breakfast and dinner in the family, with lunch eaten at the school cafeteria. On excursions days, a packed lunch will be provided. Host families live approximately 20 -25 minutes from the school. The first day of classes host families will accompany you to the Parc Imperial building where lessons take place and activities will be organized.